There are two “Million Dollar Pianos” in the news at the moment. Firstly Elton John has announced new performance dates for his “Million Dollar Piano” show at Caesar’s Palace, Las Vegas. And secondly, an art-case Steinway, dubbed the “Million Dollar Steinway – A Prince’s Love Piano” is currently up for sale at Sonny’s Piano Warehouse, Long Island, New York for… a million dollars, of course. In this post, I’m going to look at the Elton John piano. The Million Dollar Piano show made its debut performance in September 2011, initially for 16 nights. There have been almost 150 subsequent performances. New dates have just been announced for later this year (see end of post). However it’s the piano itself that interests us here. 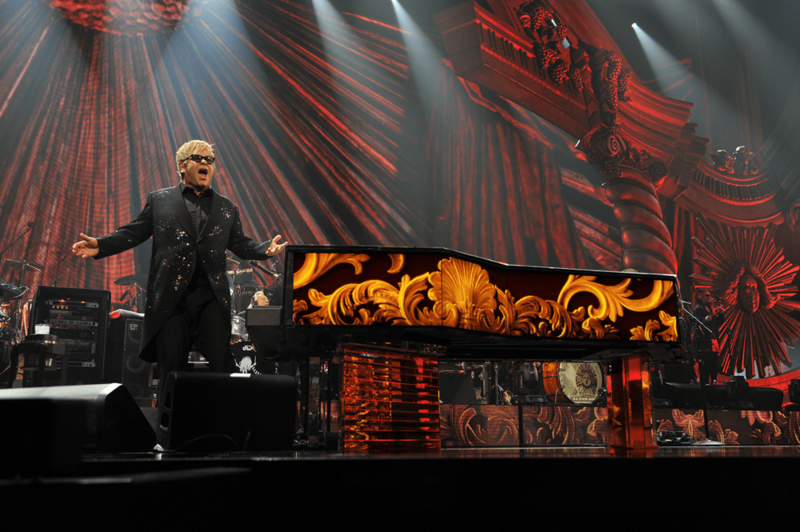 Apart from Elton himself of course, the piano is the focus of the show – it gets top billing! So as this is a Las Vegas spectacular, this instrument has to be absolutely the most visually stunning instrument ever produced. To achieve this Akie Hinokio, from Yamaha Design Labs, came up with an ultra-modern high-grade acrylic angular design. But what sets this instrument way apart from any other piano is that it incorporates by 68 separate LED Video screens and programmable LED lights. The piano can thus be visually transformed using an ever changing array of images, patterns, and colours. It can thus eclipse the already sumptuous stage set. The piano rests on prism-like acrylic supports (rather than wooden legs), and these reflect and refract the light making the piano appear to float above the ground. By judicious programming the piano can just disappear into the background or reappear to become part of the centre stage. 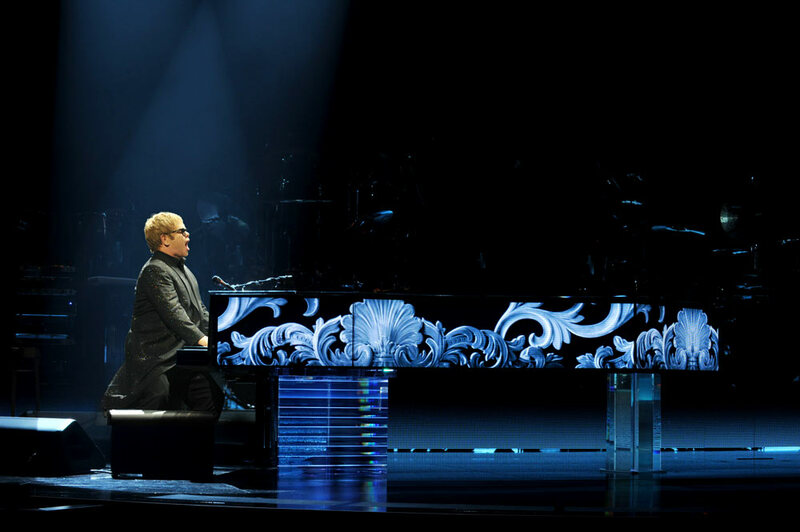 But the instrument doesn’t just need to look good – it needs to deliver audiowise, and compliment Elton’s playing style. 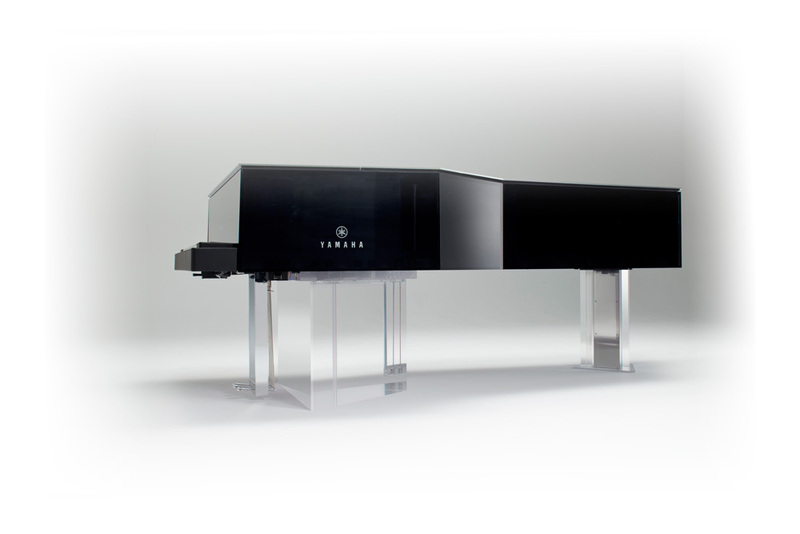 The core piano is a heavily modified Yamaha CFIIIS 9ft concert grand. The harp and hardware are made from nickel rather than brass. The keyboard is fitted with MIDI sensors to enable visual and aural effects to be added. Overall the instrument weighs in at 3,200 pounds (1,451kg). A ‘standard’ CFIIIS weighs 500kg! Adding it all up… the piano is probably worth a damn sight more than a million. Love the article about Elton John. Thanks for his touring dates too. Whaaaat he’s playing on a million dollar piano?